A personification of hard work is the Founder and Chairman of E.S. Group of Institutions. 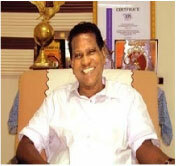 He has strived for years to impart education to the economically backward and the rural people. He is industrious and dedicated to the improvement of the socio economic standard of the society. He has continued to establish a number of educational institutions which serve to fulfill the heterogeneous interests of the students to achieve their dreams.